Sacramento CA is fortunate to have the dedicated experience and skills of the health team at Anderson Chiropractic. Our Sacramento chiropractor, Dr. Gregg C. Anderson, uses a holistic approach to help you heal your injuries, reduce your discomfort and improve your ability to enjoy life. If you are looking for natural health care in or around the Sacramento area, we invite you to Anderson Chiropractic for effective treatment options. Dr. Anderson graduated from Life Chiropractic College West with his Doctor of Chiropractic Degree. Dr. Anderson also has a master's degree in psychology to help you deal with mental and emotional concerns that may be leading to physical pain. Our very active chiropractor, enjoys hiking, kayaking and biking in the beautiful CA outdoors. Dr. Anderson makes your transition to chiropractic care an easy one. You can schedule your appointments on line, by phone or by walking into our chiropractic care center. Our new patient center on the web-site has printable health forms for you to fill out and bring with you to your first appointment. Dr. Anderson uses your health history to help him establish a personal care plan for your condition. Plus, this health information gives him an idea of which conditions he can help you avoid. For a sneak-peek at our center, take our virtual tour. You see our waiting area, but you will not spend much time here. Dr. Anderson typically sees patients within a few minutes. You are always greeted with a smile at Anderson Chiropractic. We invite families to bring their children and parents as we treat people of all ages. Our practice aims to stay green. We use electronic health records and a digital x-ray system to store your information and track your progress. Our health team works with you to educate you on nutritional, lifestyle and exercise guidance that enhances your overall health as well as helps you recover. At our office, you can expect to make friends or see your neighbors. We encourage referrals and want to share our alternative health options with as many Sacramento residents as possible. Dr. Anderson and the wellness team at Anderson Chiropractic believe in the healing benefits of chiropractic care. Dr. Anderson positions your spine and joints into an alignment that allows strong nerve signals and circulation. This increases injury healing and restores your body's balance. When your body is in alignment, it is best able to recover and you experience a healthier life. Chiropractic care is essential after an injury from sports, work or an auto accident. The sooner you allow Dr. Anderson to evaluate and treat your injuries, the sooner you are able to return to your favorite activities. 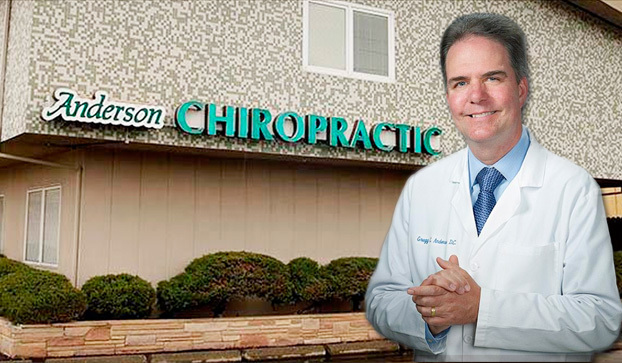 Dr. Anderson has been selected as the top chiropractor by Sacramento Magazine in 2014, 2015 and 2016. Visit us today and experience for yourself the difference natural chiropractic care makes in your world. Please stop by the office or contact us today at 916-485-5433.